It's this fear of being bad that keeps you from being good. When you do not allow yourself from writing bad, you are also stopping yourself from coming up with good writing. You constrict the flow of creative energy. Good writing and bad is only a matter of perspective. 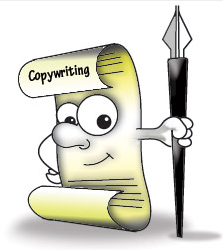 What is considered as good writing today is copy that will never get attention at some other time. Look at SEO copywriting. It gets your site to rank well on search engines, but it's going to read like everyone else's copy. When you write like everyone else does, how will your copy stand out? That's not good writing either, isn't it? This is why our voice is different from everyone else. Use your own voice when writing. Allow yourself to write bad content. Then the creative juices will flow. Nine out of ten copy you make is going to be trash. But that one time you don't make bad copy, it's going to be exceptional. I guarantee it.